If your brakes are communicating that they need service by screeching, pulling to one side, or responding slowly, these aren't signals that should be ignored. Head to Eddy's Toyota to have our technicians check out your brakes and the inspection will be free when you present this coupon. Our factory trained technicians have knowledge and experience to effectively diagnose your brakes--we'll let you know which brakes need further service or replacement. You can maintain your peace of mind knowing the condition your brakes are in. Don't put off your brake service--take advantage of our complimentary brake inspection while it lasts. 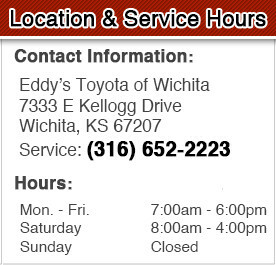 At Eddy's Toyota, we're proud to offer great savings on Toyota maintenance and repairs for Wichita and surrounding areas this winter. Our state-of-the-art service department is staffed by technicians that live in and care about your community. We also offer deals on Genuine Toyota Parts and Accessories for the Kansans with a DIY spirit. Of course, it's easy to find your next vehicle in our new Toyota selection or inventory of certified pre-owned vehicles. You can schedule your service appointment today at (316) 652-2223. Bring the service coupon of your choice to our convenient location at 7333 E. Kellogg, Wichita, KS 67207, serving Hays and Salina, KS.